No. 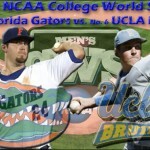 4/6 Florida Gators baseball (31-11, 15-6 SEC) swept three home games against the defending National Champion No. 24/15 LSU Tigers (32-13, 11-10 SEC) at McKethan Stadium in Gainesville, FL, over the weekend. Area weather prevented the games from running smoothly, but the Gators did not let that deter them from three somewhat dominating victories. The series opener on Friday night was suspended in the bottom of the fifth inning (rain) as Florida held a 7-0 lead; it would end with LSU piling on some runs but the Gators coming out on top 8-5 on Saturday. Sophomore Alex Panteliodis (7-2) got the start Friday, tossing five shutout innings with two strikeouts. Junior closer Kevin Chapman (S8) finished the job late Saturday, striking out two in 2.2 scoreless innings for the save. Sophomore outfielder Tyler Thompson (3-3) and junior second baseman Josh Adams (1-3) each tallied three RBI, Adams’ coming off a three-run homer in the second inning. In the middle of the opening game, Florida completed its first official win of the series with a 7-3 victory early Saturday afternoon. Freshman starter Hudson Randall (5-3) threw a career-high seven strikeouts in eight innings of work, though his first pitch of the game marked the 11th home run of the season for Tigers’ OF Mikie Mahtook (2-4). Senior OF Jonathan Pigott (1-2) led the way with two RBI for UF. 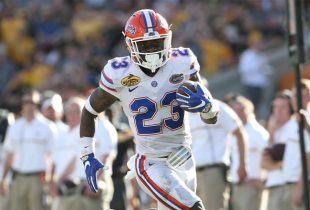 Sunday’s finale was all about power for the Gators. Senior OF Matt den Dekker (5-5) and freshmen third baseman Austin Maddox (1-3) and starting pitcher Brian Johnson (2-4) all hit moon shots, with Johnson recording his first career grand slam while picking up his fourth win of the season (4-2) in 6.1 innings. Both den Dekker and Johnson totaled four RBI on the day with Maddox picking up three of his own. Though Florida remains one game back of No. 3 South Carolina (34-9, 16-5 SEC) in the Southeastern Conference standings, it has won five consecutive games against top-10 opponents and is now a sterling 23-3 at home in 2010. The Gators have won six of seven SEC series this season, winning five straight for the first time since 2005. 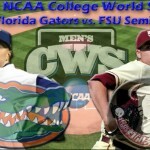 The Gator Baseball team is very young yet they have been playing very well. If they do not reach the CWS this year next year they should. This team is way better than last years team and we almost made it. I wold like to think if we continue playing at this level we will be in Omaha and make a serious run at it. Too bad this team is playing in front of one of the worst fan bases in the SEC. Just pathetic!! !